They say the hottest chili pepper in the world is the infamous Carolina Reaper Pepper. This pepper is so hot that it’s become a challenge across social media to eat a chip coated in its flavour and go as long as possible without taking a drink. Chilli Gold 2 won’t burn your tongue, but it’s sure to provide the same thrilling kick as the Carolina Reaper challenge. In this fiery follow-up to Lightning Box’s original Chilli Gold game, this offering has even more hot and sizzling bonus chances. It also serves up enhanced artwork, and a generous portion of Stellar Jackpots, which makes for a complex and delicious dish! Since their inception over a decade ago, Lightning Box have established themselves as an electric presence in land-based and online gaming. Founded by mathematicians, their games make use of a special brand of algorithmic genius, to create dynamic and truly original gameplay. This doesn’t mean that they skimp on the artistic side of creation, however, and their titles are invariably as gorgeous to look at as they are to play. WILDS – Chilli Pepper symbols are WILD. They can appear on reels 2, 3 and 4, and substitute for all other symbols. GOLDEN WILDS – on reels 2-5, during Free Spins, you might be lucky enough to glimpse a Golden Chilli Pepper,which will double the prize when it lands on a win line. SCATTERS – chilli pepper aren’t just wilds, they’re SCATTERS, too. Depending on how many are stacked on the reels, they award a number of free spins. They can award a number of free spins, depending upon how many are stacked on the reels. 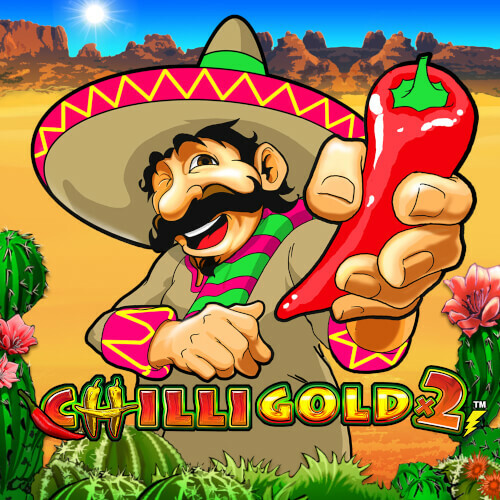 So, the player can win up to 21 Free Spins, with the possibility of a new golden chilli on reels 2-5. Gamble – those players who like their game seriously spicy can gamble their wins up to a total of times by choosing a card suit or colour, with the chance to double or quadruple their wins with correct guesses! Stellar Jackpots – this is an unlikely but effective side game. It is randomly-activated, and takes you from the desert to deep space. The objective is to shoot icons for a chance at a prize, or to advance to the next level. It’s the Jackpot level you’re hoping to reach, though, in which you shoot spaceships to match 3 symbols, and win a Mini, Minor or Major Jackpot. The handy Autoplay feature also gives you the chance to sit back and shake your maracas as you watch the reels spin by. Chilli Gold 2 serves up a truly flavoursome and satisfying dish of entertainment, winning chances, and bonus features. This one’s a scorcher!